It is so easy to prepare that you can even cook it every weekend in your own home. Eat the Nigerian Fried Rice with Moi Moi, Nigerian Salad or Coleslaw and you will feel like you are in paradise island. 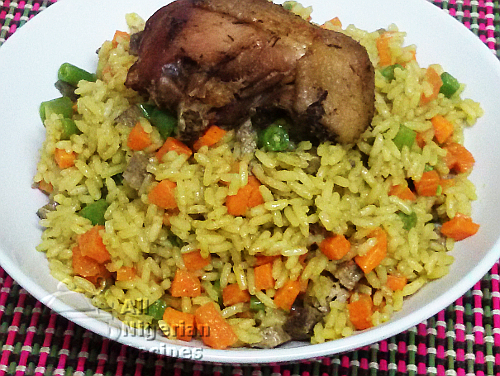 Are you ready to go on the Nigerian fried rice cooking spree? Wash all the vegetables to be used in cooking the fried rice. Scrape and cut the carrots into tiny cubes. Cut the green beans into small pieces of about 0.7cm long. Soak these 2 vegetables separately in hot water for about 5 minutes and drain. Cut 1 bulb of onion. Set all these aside. Cook the cow liver till done and cut into tiny pieces. To save time and energy, you can cook the liver with the chicken as I did in the video below. Cut the whole chicken into pieces and cook with the Knorr cubes, thyme and 2 bulbs of onions (chopped). When done, grill in an oven or deepfry with vegetable oil. This gives it a golden look which is more presentable especially when you are entertaining guests. Read how to season and grill chicken for more details. Parboil the rice using the method detailed in parboiling rice for cooking fried rice. A well parboiled rice ensures that the grains of the rice will not stick together when the rice is done. Rinse the parboiled rice with cold water and put in a sieve so all the water drains out. Pour the chicken stock into a sieve to remove all traces of onions, thyme etc used in cooking the chicken. Pour the stock into a pot and set to boil. Once the water boils, add the parboiled rice. Also, add 1 tablespoon of plain yellow curry powder, then add salt to taste. The plain yellow curry powder is merely for colouring so should not contain chilli. The water level should be slightly less than the level of the rice; at most it should be at the same level as the rice. This is to ensure that all the water dries up by the time the rice is cooked and that the rice is not over cooked. This is the quantity of water that will cook the rice and the grains will not stick together. Stir the contents; cover the pot and leave to cook on medium heat. This way the rice does not burn before the water dries up. Once the water has dried up, the rice should be cooked perfectly. Perfect fried rice is one that the grains are separated from one another, resistant to the bite but not hard. 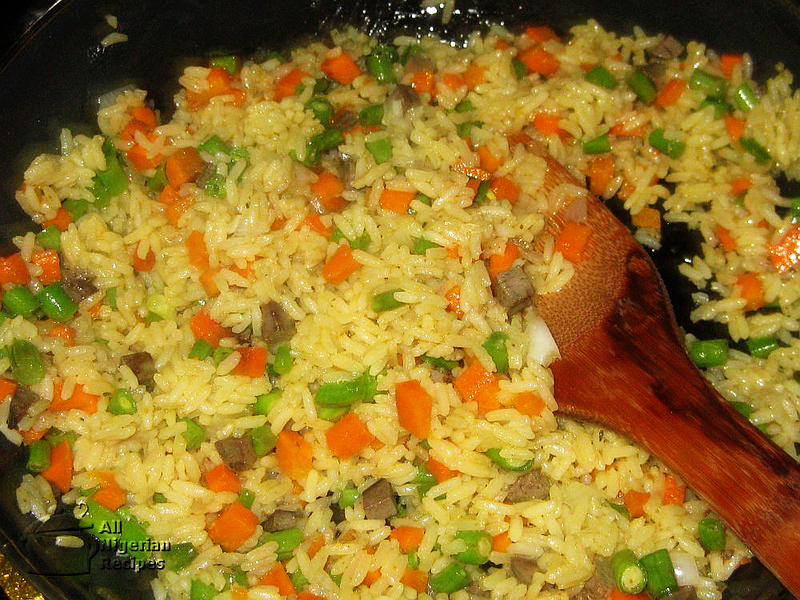 Now, transfer the rice to a casserole dish or another pot to help cool it down quickly. Again, this is essential to keep the grains from sticking to each other. If left in the original hot pot, the rice will continue to cook and eventually stick together. 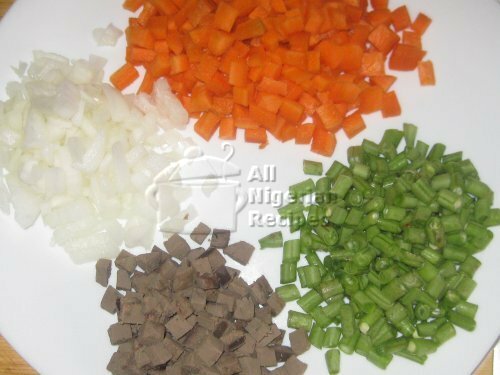 At this point, it is advisable to divide the vegetables into say 4, 5 or even 6 equal parts. The rice will be fried in batches so this number depends on the quantity of rice you can comfortably fry in the pan or pot. Also, divide the cooked rice and the diced cow liver into the same number of equal parts. Now pour a small amount of vegetable oil into a frying pan. This quantity of oil should be such that it would be absorbed by 1 part of the cooked rice and 1 part each of the vegetables. When the oil is hot, add 1 part of diced onions and stir for 10 seconds, followed by 1 part of diced cow liver, one part each of the diced vegetables, then 1 part of cooked rice. Add more salt if necessary. More curry powder may also be added at this stage if you need to touch up on the colour. Stir till all the ingredients have mixed well and transfer to a dry pot. Repeat this for the remaining batches of the ingredients. The fried rice is ready. Serve with fried chicken. You can add coleslaw, Moi Moi or Nigerian salad.